Thanks Xyly! Can't believe this malware is so "not protected"
even after simple "strings" you can see what happens, like where it sends logs and so on...anyway your review is straightforward. Just found these samples today on http://royjamesinsurance.com/images/ (the sload.exe and sload1.exe are just malicious firefox extension droppers, sload1.exe was dropped by andromeda bot). I am sorry, I wanted to help analyze this, but I did not understand your report. I saw two of them (the rad marked) were uploaded in the VT as per you posted url. Are these your mentioned THEY or sload.exe and sload1.exe file? Because I didn't find these sload.exe and sload1.exe and don't know the hash of it. 2. You mentioned you get it from http://royjamesinsurance.com/images/ ? from which url precisely? Your reply will help. thanks. Here there are all of them + latest one before the bad guy removed all the files because malware report. Let us know about your finds. exitthematrix wrote: Here there are all of them + latest one before the bad guy removed all the files..
Oh man..., why don't you say this sooner? Will post to this thread soon. To @Xylit0l Like I promised, I investigated, but did not know the nature / scheme of infection, thus I am so confused & not sure which one binary are you mentioned in PM to analyzed, anyway I did wack every data (almost everything I think) from TcpAdaptorService.exe and TcpAdaptorService1.exe. This is going to be a long post, I will post soon.. Salute to KernelMode, I will share my monitor data, so feel free to submit your thought. Both work with the same logic. 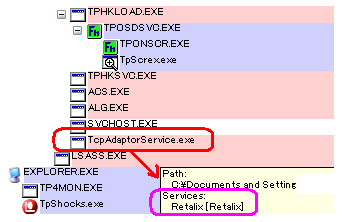 so let's call it as per filename TcpAdaptorService.exe I started with the below details. In the end this process/daemon is responsible for everything and stays resident. "RegSetValue","HKLM\SOFTWARE\Microsoft\Cryptography\RNG\Seed","SUCCESS","Type: REG_BINARY, Length: 80, Data: 6D 7B CA A8 FF C8 F9 02 99 7F B6 FD 9C 12 11 DE"
HKLM\System\CurrentControlSet\Control\Terminal Server\TSAppCompat","SUCCESS","Type: REG_DWORD, Length: 4, Data: 0"
HKLM\System\CurrentControlSet\Control\Terminal Server\TSUserEnabled","SUCCESS","Type: REG_DWORD, Length: 4, Data: 0"
HKLM\System\CurrentControlSet\Control\ServiceCurrent\(Default)","SUCCESS","Type: REG_DWORD, Length: 4, Data: 13"
HKLM\SOFTWARE\Policies\Microsoft\Windows\Safer\CodeIdentifiers\TransparentEnabled","SUCCESS","Type: REG_DWORD, Length: 4, Data: 1"
HKLM\System\CurrentControlSet\Control\Session Manager\SafeDllSearchMode","NAME NOT FOUND","Length: 16"
You'll see more details in pastebin, so what about the Daemon/Process kicked ? And the highlights are: The computer name info, Terminal Server & \WinSock2\Parameters data was grabbed. What had happened if we let this run? Worth to try to decrypt the callbacks traffic. PS: @Xylit0l if you have the traffic I can help to decode with the above base. Does the exe send any TCP data encoded with that key in the registy? And if so, what type of encryption? Thanks! Very good work.